Diners represent comfortable causal eating establishments that offer menus filled with familiar dishes that are as far from being mysterious and fussy as you can get. There’s no need for waitstaff to explain the menu and ask you if you have any questions. You might need to know the options for the Blue Plate Special, Plate Lunch Special, or Meat and Three, but that’s about as far as the explaining needs to go. 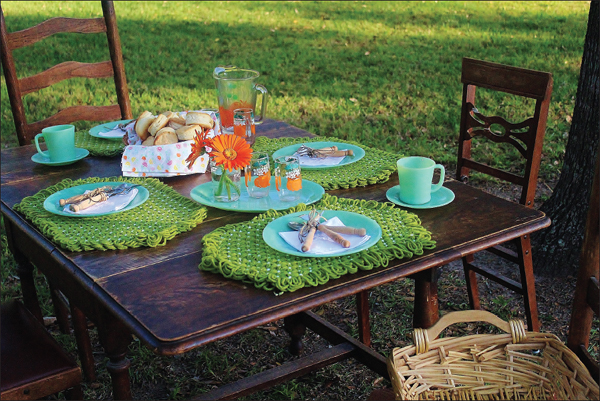 Everything served reminds you of good eats from the kitchens of your mother, grandmother, and favorite aunt. There’s no need for your palate to prepare for an unknown taste adventure. Cozy up to the counter or sit at a booth and relax as you enjoy simple favorites. 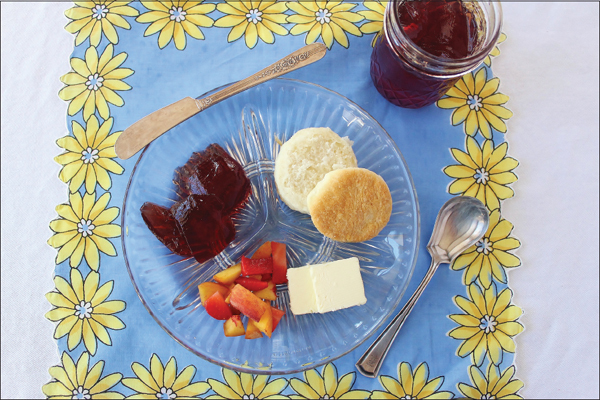 Choose your favorite biscuits to enjoy with the toppings included in this chapter. There’s no right or wrong answer. Browned pork sausage in a milky sauce is one of the South’s most popular dishes. I prefer sausage gravy, heavy on the sausage. Stretch the gravy further by increasing the amount of flour and milk. I prefer Jimmy Dean’s Original or Sage sausage. Brown 1 pound of bulk sausage in a cast-iron skillet. Don’t drain. Add flour and stir. Cook for about 3 minutes until all the white and lumps from the flour have disappeared. Gradually add milk, stirring constantly. Add as much milk as you need to reach the desired consistency. Make sure to scrape up all the “goodies” from the bottom of the pan as you stir. There’s lots of flavor in the goodies. Continue to cook and stir until the gravy thickens. When you combine bacon, tomatoes, and onions, the result is sure to be fittin’ to eat. Make gravy out the ingredients and you become a superstar. Tomato gravy is as old as the hills. Generation after generation grew up loving it. Fresh or canned tomatoes can be used. Fry bacon in a cast-iron skillet over medium heat till crisp. Remove from pan and set aside. Reserve two tablespoons of the bacon drippings. Sauté onion in bacon drippings over medium heat about 15 minutes or until onion is soft. Add flour to skillet and stir well until flour and bacon grease have mixed. Continue cooking and stir occasionally until the flour mixture is the color of peanut butter. This may take 15 to 20 minutes. Slowly add milk, stir continuously until mixed. Simmer over medium heat until thickened. Add salt and pepper. Taste and adjust seasoning as needed. Garnish with crumbled bacon—or eat all the bacon yourself as a reward for the cook. 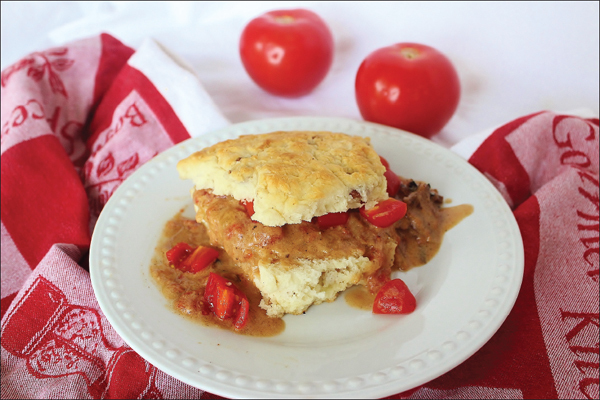 Tomato Gravy is especially good served over Bacon Cathead Biscuits (see recipe page 61). Good jelly is as much a treasure as a good biscuit. We have a small grape arbor in our backyard and we grow a Southern grape variety called muscadine. The flavor is unlike any other grape. Muscadines are deep purple and their cousins, scuppernongs, are golden. Southern children are taught how to take the grapes in their mouths and separate the hulls and seeds from the meat and juice using only tongues and teeth. The hulls and seeds are spit out and the meat and juice consumed. I never learned the proper way of eating muscadines and scuppernongs and always cheated by using my hands. The flavor is tart and slightly musky. Squirrels and birds start feasting on our grapes before their quite ready to harvest. Most years, they leave us just enough for a batch of jelly. To extract juice, wash and pick over 2 gallons muscadine grapes. Place in a stockpot and cover with water. Bring to a boil and cook for 25 minutes, mashing with back of wooden spoon occasionally. I have my grandmother’s potato masher that I use for this, but a wooden spoon works just fine. Remove all the grape pieces. Strain juice through a cheesecloth. Store in refrigerator overnight. Strain again before cooking. Wash canning jars in soapy water. Rinse and sterilize by boiling for 10 minutes. Keep hot until ready for use. Wash lids and rings and place in a small pot. Bring up to a boil and then let simmer until ready for use. Mix juice and powdered pectin in a large pot and bring to a boil. Add sugar all at once, stirring until sugar dissolves. Boil rapidly until mixture reaches 220° (or 8° above boiling point if you’re in high altitudes) or until the mixture coats the back of a metal spoon, about 20 to 30 minutes. Remove from heat and quickly skim off foam. Pour jelly immediately into hot canning jars, leaving ¼-inch headspace. Wipe rims and adjust lids. Remove jars and set on a kitchen towel. Let them sit for 12 hours undisturbed. 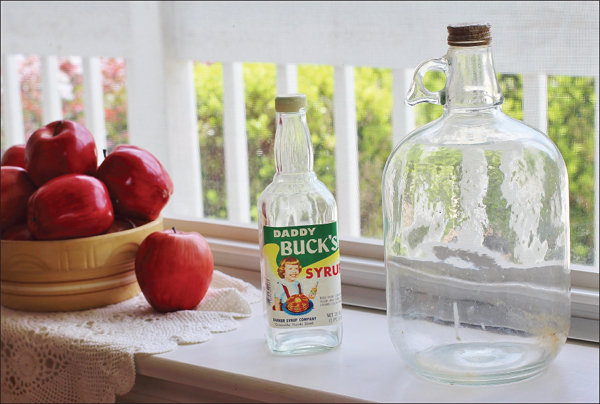 A cane syrup bottle and a gallon jug used to sell cane juice. Sugar cane thrives in humid and hot climates. That pretty much describes anywhere in the Deep South. During my childhood, it was common to see sugar cane fields in southeastern Alabama. It wasn’t grown for sugar, but rather for chewing or syrup making. Granddaddy loved to bring home canes for us. He’d remove his little keen knife from his pocket, cut a section off the large cane, peel it, and then cut the inside part into chunks for us to chew. The juice of sugar cane is bold and daring. I had an aversion to the texture, so enjoying a “chew” was left for someone else. Just down the street from my grandparent’s home, a mule driven cane press operated during harvest time. Harnessed to the press, the mule walked around in a circle while the press extracted juice from the sugar cane. There was always a big cast-iron pot full of juice bubbling away and converting the cane juice to cane syrup. The cane press operator sold both the juice and the syrup. During the simple times of my childhood, a trip to the cane press held all the excitement of Disney World. The heavy perfume of cane syrup hung in the air. People gathered around to watch the mule work. Farmers in their denim overalls inspected the canes and chose the best ones to share with children just like granddaddy shared with us. Gallons of cane juice were on display in clear jugs. Cane syrup was packed up in tin cans. It’s a shame that so many of today’s children can’t appreciate the excitement found in events that are dependent on technology. Cane syrup’s flavor is more akin to molasses or sorghum syrup than to maple syrup. In fact, cane syrup and maple syrup are so different, it’s hard to believe they have anything in common. The flavor of maple syrup is dainty compared to the boldness of cane syrup. The combination of cane syrup and peanut butter is unbelievably good. This mixture is good on waffles and pancakes, also. Mix well. Spread on biscuits. Cane syrup mixed with softened butter is made for sopping. The ratio of syrup to butter is a matter of personal preference. 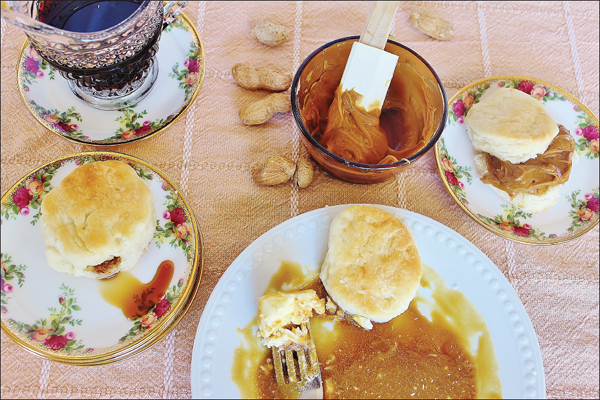 My granddaddy had cane syrup and biscuits for breakfast every day of his life. His favorite brand of store-bought cane syrup was Top o’ the World. The company that produced that brand has been out of business for a long time. Today, I use Steen’s Cane Syrup. Pour syrup onto small plate. Mix in soften butter with a fork. Break off small pieces of biscuit and sop up the syrup. Southern children learn to eat biscuits filled with syrup. It’s a childhood ritual. Make a hole partially through a biscuit using your finger. Fill hole with cane syrup. Hand the biscuit to a happy child. My friend, Dawn Wagner, told me that one of her favorite childhood memories was the Chocolate Gravy her Mama would make on Saturdays to top their biscuits. 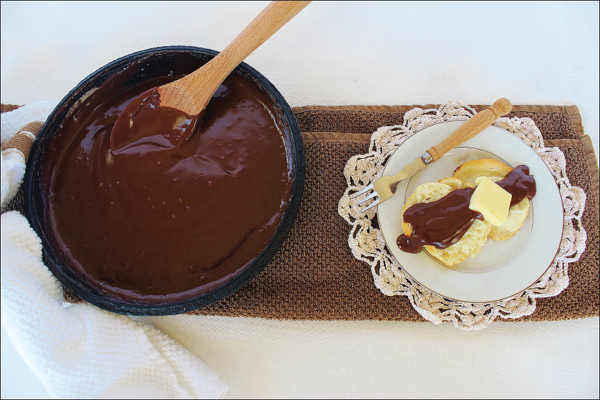 On one of the days Dawn came to my kitchen to help me, I thought it would be a nice gesture to make Chocolate Gravy. The day wasn’t Saturday and I’m not Mama, but I sent her home with a container of Chocolate Gravy and a fresh batch of Buttermilk Biscuits. Melt butter in a cast-iron skillet. Add sugar, flour, and cocoa. Stir until sugar is dissolved and all ingredients are well mixed. Remove from heat and slowly whisk in half of the half-and-half stirring constantly to prevent lumps. Return to heat and add remaining half-and-half, whisking constantly. Continue whisking and cooking until gravy has thickened. Serve immediately with Buttermilk Biscuits. Compounds butters are wonderful for entertaining. The name compound makes them sound much more complicated than they are; they’re softened butter with stuff mixed in. People are generally impressed and have no idea how utterly simple they are to make. I like to have compound butters, sweet or savory, for house guests. They add such a beautiful touch and make your guests feel special. An added bonus is deliciousness. 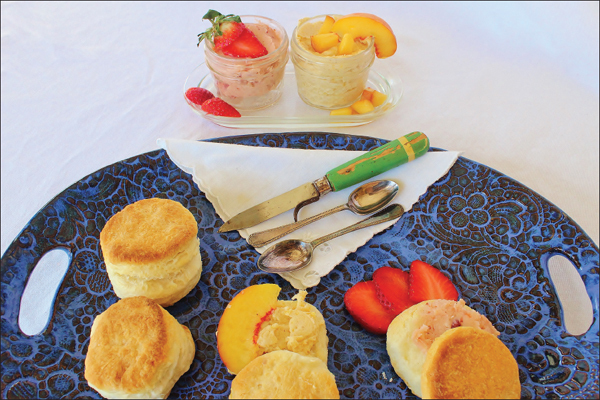 Peach and strawberry butters are heavenly on a hot biscuit of your choice. Store them in a covered glass jar and bring to room temperature before serving. Or, place the soft whipped butter on waxed paper and roll into a log. Chill well and slice off the desired amounts for each serving. Rewrap with waxed paper and store in the refrigerator. Whip with an electric mixer until soft. Whip with an electric mixer until smooth. 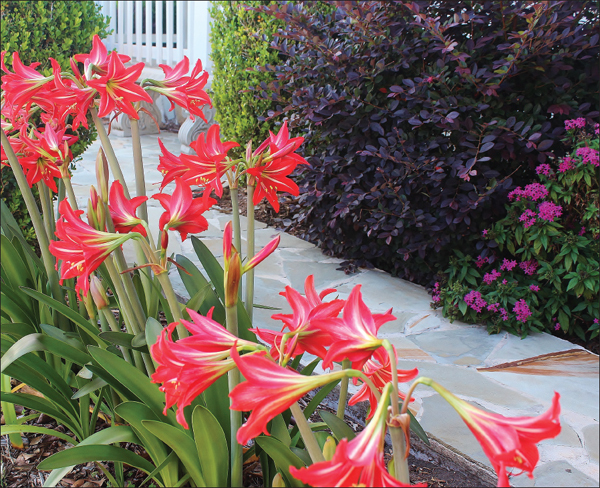 Along with the little white bowl, amaryllis lilies that were pass-a-longs from my grandmother, are priceless. The earliest memory of breakfast at my grandparent’s kitchen table contains a little white pottery bowl. It was always there, right next to a bottle of cane syrup and a dish of softened butter. The importance of the little bowl was lost on me as a child. Back then, it was just a bowl. Today, it’s my priceless treasure. Sitting atop a black and white speckled enamel table, the little white bowl was filled with redeye gravy made from fried ham and coffee and was on the table each time breakfast was served. Granny didn’t fry ham every day. When she did, she made an ample supply of redeye gravy; much more than could be consumed over several days of breakfast. She’d refrigerate the leftover gravy and reheat it every morning. When the gravy supply got low, that was her signal to fry more ham. The gravy that was left became the starter for a new batch. I use the little white bowl infrequently. The tiny cracks in the finish make me scared to death to handle it much for fear that it will break. Filled with blue mophead hydrangea blossoms, it makes a lovely centerpiece for a breakfast table, but I’ve stopped using it for that purpose, too. A stamp on the bottom of the 5-inch by 3-inch bowl that reads U. S. A. is the only identifiable mark on the bowl. Cracks are on the surface and scuff marks are on the inside and outside. The patina has turned from white to cream. The average person would say the bowl isn’t spectacular looking and not even worthy of inclusion in a yard sale. That same average person wouldn’t know the hands of my grandparents touched the little white bowl countless times. As far as I’m concerned, anything my grandparents touched turned to gold. Country ham is salt cured with a process that takes months to complete. Benson’s Country Hams is one of the few sources left for hams cured the old-fashioned way. 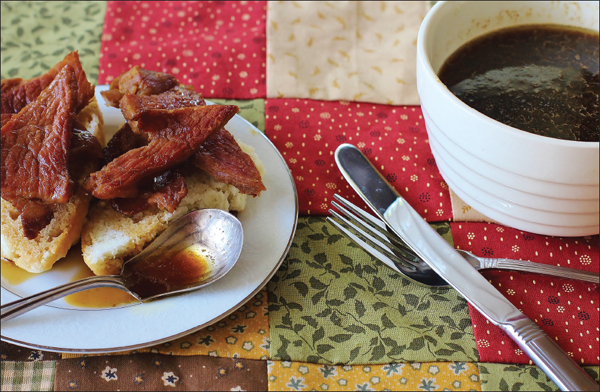 Redeye gravy is made in the pan after country ham’s been fried. The gravy is thin and customarily served over grits. Place a few slices of fried ham on leftover biscuits and drizzle on redeye gravy. You must eat it with a fork and knife, but it turns day-old biscuits into something good. 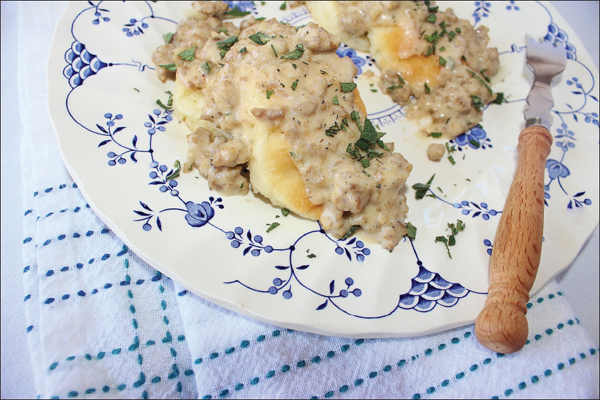 The biscuits hold up to the watery gravy better if they’re toasted. Ham is lean and requires added fat to fry. Place bacon drippings in a 9-inch cast-iron skillet over medium heat. After the bacon drippings melt, add the ham in batches and cook until browned on both sides. Remove to a platter and set aside. Add coffee to skillet and use a wooden spoon to scrape up all the bits from the bottom. Add water and honey, stir. Place browned ham slices back in skillet. Continue to cook on medium heat until the gravy is reduced by one-third. Slice open leftover biscuits. Place several slices of ham on each side of the biscuits. Drizzle gravy over ham.